In the world of environmental pollution especially related to big oil and carbon, there are a handful of attorneys who command the respect and grudging admiration of the global corporations whose pursuit of profit has frequently resulted in human suffering and serious pollution of the environment. Stuart Smith, a home grown native of Louisiana resides at the top of this exclusive list. If through employment or bad luck you find yourself a victim of the pollution resulting from oil exploration, drilling, or related activities, you would be hard pressed to find a better advocate to protect your interests. 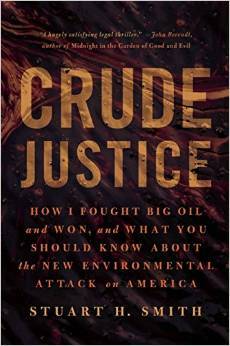 In his new book Crude Justice: How I Fought Big Oil and Won, and What You Should Know About the New Environmental Atack on America, a non-fiction book that reads like a legal thriller, for the first time Smith details a storied career tirelessly working against environmental polluters and long odds to secure landmark judgments and legal protections. The detailed histories of cases which took as long as twenty years to litigate against Chevron, ExxonMobil, BP and others, provide an insight into the legal system that for most of us, is a mysterious realm. It is that rare page-turner of a book that both entertains and informs on a subject which concerns everyone. Crude Justice is the detailed story of Smith's clients and breakthrough legal victories on their behalf. It is a cautionary tale of what has happened in the United States as the system of government has frequently failed to protect the interests of its citizens. All too often the US government has allowed (even encouraged) corporations to exert undue influence on the political process in order to subvert legitimate regulations and protections from a carbon industry seeking profit without regard to external costs and harmful consequences both to the health and welfare of citizens and the environment. I spoke with Stuart Smith about Crude Justice, career, and ongoing litigation related to the BP Oil Spill which is approaching the Five Year anniversary this spring. SS: When I got involved with the Street litigation which is mentioned prominently in the book this was the first case of its kind (oilfield radiation pollution) and we quickly recognized that this problem was not isolated to the middle of Mississippi. We knew there was a lot of this waste laying around. After the trial, the work up and settlement we began getting calls from people who had problems, so one thing led to another and I made a career out of those type of cases. Suing oil companies for radioactive oil field waste pollution. We are still doing those cases today all these years later. JC: You have been doing this for so long and enjoyed great success, have you ever felt your personal health and safety were threatened? SS: I have worried about it of course, but never any attempts I am aware of. I try to be cautious. JC: At this point you continue to devote a great deal of time and resources to addressing these environmental issues through the legal system, how effective do you feel the system is overall? Especially in terms of environmental litigation against large corporate polluters with virtually unlimited resources? SS: I think the legal system in the United States while it is in my opinion the best in the world, it is very slow, very expensive, and very time consuming. So you really have to be ready to wait to get a judgement against somebody especially if they are not going to cooperate. Because of the trials we have had and the work we have done, we seem to be able to get a quicker result than we normally would have had we not done a whole host of cases previously. In general it is very slow, BP is a perfect example of that. Here we are five years post-spill and thousands and thousands of cases remain unresolved with no end in sight unfortunately. JC: Do you any feeling given your experience how long the BP cases will potentially drag on in the courts? Are we looking at a decade or longer? SS: Well, I certainly hope not. I mean what has happened is a lot of cases were settled in the class action settlement, but a lot of cases were not. A large number of people opted out of the settlement, including a number of my clients. A large number of cases which were not included in the settlement such as banks who lost money, the offshore supply industry that lost money, several other classes of cases and opt-outs are pending. Based on the current status of litigation the trial judge stayed all those cases, they can't really go anywhere right now. Our hope is that soon the court will allow these cases to proceed towards trial in different courthouses along the Gulf coast at which time I think things will start moving much more rapidly. So you could be looking at two, three, or fours years before these cases are resolved. JC: During the BP Spill with the resources you deployed, you as much as anyone were getting and continue to get accurate information about the reality of the spill in terms of size and impacts as well as the long term consequences; especially with the heavy deployment of the Corexit dispersants. Just last week another study was released by the University of Florida showing a tremendous amount of crude remains on the ocean floor where any storm surge or turbulance stirs it up and a major hurricane would be devastating all over again. How do you see the long term impacts of this on the culture and livelihood of people on the gulf coast? SS: The immediate and major impact is of course the victims of the toxic exposure who live along the coast. These people are still being ignored, the settlement which was reached on the personal injury claims was woefully inadequate. They do not have enough lawyers representing these people, a lot of these people are still quite sick, god bless them but they are probably the victims that are going to be living with this for a long long time - if they live that long. As far as the gulf itself the ecosystem is permanently damaged, at least permanent in the sense of our lifetime, our children's lifetimes. The gulf will never recover in the near future - it is going to be a matter of geologic time and that is one of the frightening thing's about the President's (Obama's) recent proposal to open up the East Coast to oil drilling. This despite the fact that all of the recommendations of his own BP Oil Spill Commission have not been satisfied or done. It is very frightening what is going on in the energy sector with the rush to continue these extremely risky and dangerous drilling practices. JC: I suppose the upside is it will continue to keep you busy for the rest of your life. SS: It will certainly keep my younger partners and associates busy for a long long time. I don't know how much longer I will continue doing this, I'm ready to smell the roses. I will continue to keep my feet wet, but with a much lower level of stress.